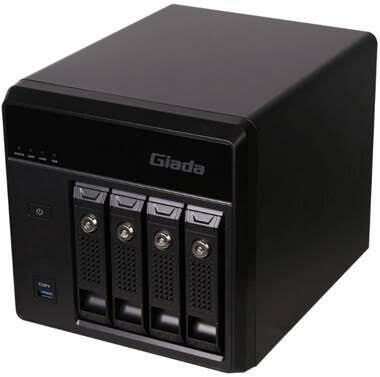 Giada’s GT400 MicroServer is a 4-Bay storage system for Windows and Linux OS, built for low power consumption and 24/7 reliability. The GT400 supports RAID 0, 1, 5, and 10, and provides convenient & secure file sharing and networking features for small to medium sized enterprises and new startups while facilitating high efficiency and quick sharing functionality. Use case scenarios include small data centers, file servers, web servers, mail servers and print servers. The GT400 is especially designed as a server to be utilized in SMEs or small groups that are starting a business or other collaborative organizations. Choose a right server is critical for smooth operations in an organization. With secure and convenient file sharing and networking feature, the working efficiency can be greatly improved. Powered by Intel Celeron 1037U dual-core processor with an operating frequency of up to 1.8GHz with a low power consumption of 17W, the GT400 meets the demand for high-speed computing while decreasing the total power consumption to the greatest extent, all the while enhancing the operational stability. Compared with normal servers with Atom CPU, the GT400 is superior in terms of processor and overall performance. The GT400 also integrates built-in Intel 210AT and 82579LM dual gigabit Ethernet connectors for networking with a bandwidth of up to a gigabyte per second network throughput per port, covering any networking situation. Compared with the regular network control chip of most consumer products, the Intel controller guarantees better stability and fewer packet losses. The GT400 also delivers great scalability with two SO-DIMM slots, one m-SATA SSD port and four HDD ports. The SO-DIMM slots of the GT400 support DDR3 1333/1600MHz, and the memory can be brought up to a max of 16GB for even more efficient performance. The GT400 provides one high performance m-SATA SSD 3.0 (6Gbps) port, supporting SATA3.0 with a maximum reading speed of up to 6Gb/s, and supports m-SATA SSDs of different capacities for OS installation. Users can choose the capacities of an SSD according to different requirements. The Intel’s Rapid Storage Technology support with RAID 0, 1, 5, and 10 provides maximum flexibility, both 2.5" & 3.5" HDD can be installed into GT400. The RAID 0, 1, 5, and 10 features with the high performance HM77 chipset can provide improved read and write speeds as well as the security and safety of data storage. The GT400 MicroServer has multiple measures to guarantee the security of server. For example, the sophisticated design of HDD handle lock, padlock and K-lock makes sure the server is working under good protection. Not only that, Giada has applied its own designed and patented JAHC technology in the GT400. JAHC, Active Hardware Control Technology, provides built-in capabilities for unattended operations such as auto power on when connected to power, or a scheduled power on/off. This delivers ease of use and efficient manageability. A server needs to be multi-functional for enterprise demand, and the GT400 can easily handle multiple roles. Supporting the sharing, encryption and file backups, SMEs can utilize this MicroServer as a private cloud or data center, print server, web server, mail server, surveillance server, multi-media server or ERP server. In fact, after strict tests that covers various enterprise demands, the Giada GT400 has been proven to provide stable 24/7 services continuously. With a growing trend in data storage usage, more and more corporate buyers opt for MicroServer as the ideal storage system. For SMEs and organizations that are looking for a secure, reliable and high performance MicroServer solution, all at a cost-effective price point and space-saving size, the Giada GT400 is a great choice. The GT400 also has an optional enterprise-class wireless router function. With this feature, the server is equipped with an enterprise-class main control chip and 4 external detachable antennas. In addition to the 2.4GHz/5GHz dual-frequency technology, its maximum wireless transmission rate reaches up to 600Mbps. The professional and enhanced low-noise amplifier increase the wireless performance with better signal strength, penetration and stability performance.